Knowing muscle innervations is an important skill for medical professionals such as Physical Therapists, Physicians, and Occupational Therapists. This is a list of muscle innervations grouped by nerves and includes the spinal nerve roots that contribute to the innervation of each muscle. During PT School we were required to memorize every muscle and nerve that innervated each muscle. As part of my studying strategy, I decided to create a spinal nerve chart to group the muscles according to innervation. Part of the muscle innervation chart below includes this list and also includes a list of upper extremity and lower extremity innervations which was developed in collaboration with all the students in the PT program. 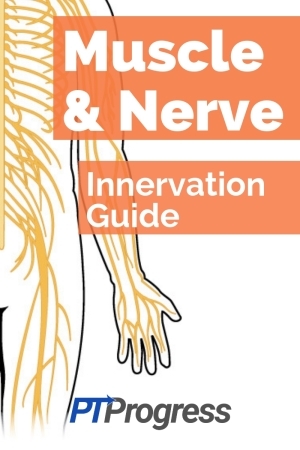 Let’s say you’re interested in knowing all the muscles innervated by the ulnar nerve. From the chart, you can see the ulnar nerve innervates the Flexor Carpi Ulnaris, Abductor digiti minimi, Opponens digiti minimi, Flexor digiti minimi, Lumbricals (3 and 4), Interossei, and Adductor pollicis muscles. Each listed muscle also includes the spinal nerve root level that contributes to the muscles innervation. The parenthesis () next to the spinal nerve root means this level contributes to the innervation but is not the primary nerve root. For example: the serratus anterior muscle is innervated by the long thoracic nerve with contributions from spinal nerve root C5, 6, 7 (8). The parenthesis around (8) means the nerve root at C8 may contribute to the innervation of this muscle, but the primary nerve roots are C 5,6,7. Associating muscles to a common nerve group is an excellent way to memorize muscle innervations. For example, when you realize that the radial nerve innervates the majority of the hand and wrist extensor muscles, you can form better associations and quickly reference this knowledge when you’re tested on it during anatomy lab or an exam. I personally used a flashcard app to list each muscle and it’s corresponding innervation. A flashcard app like Quizlet is a must have for muscle memorization. C3,4,5 keeps the diaphragm alive!